Off-flavor compound formation is a major concern for many industries and the analysis of these compounds is often in demand to address off-flavor claims as quickly as possible. However, off-flavor compounds analysis requires extensive knowledge (quality of the odor, offensive odor threshold value, etc.) and can be challenging for inexperienced analysts. To resolve this, Shimadzu introduced their GC/MS off-flavor analysis system that is equipped with an extensive database of analysis parameters, enabling analysts to perform off-flavor analysis without any prior expertise. Furthermore, with information registered on odor-causing substances from past analyses, this system also allows a quick and simple method for off-flavor analysis. 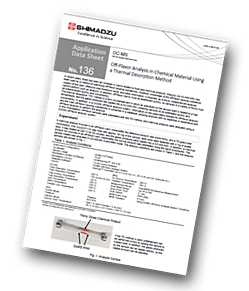 In this data sheet, both defective and normal samples were pretreated with the thermal desorption method and analyzed using the GC/MS off-flavor analysis system. The analysis detected and quantified a total of 48 compounds and the first/top 15 compounds with particularly large ratios of concentration to offensive odor threshold value were highlighted. Subsequently, the list of candidate compounds was narrowed down further to 3 likely off-flavor substances by analyzing the compound’s quantitative value for the defective product compared to the quantitative value for the normal product. Based on these comparisons, the off-flavor candidate compounds were identified.